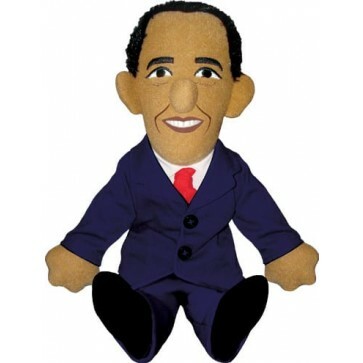 What's 11-inches tall, cute and cuddly, and is the leader of the Free World? It's the Barack Obama Little Thinker. Yes, now you can own the 44th President of the United States in doll form. Dressed in his traditional blue suit, white shirt, and red tie, the Barack Obama Little Thinker is as Presidential as a doll can be. Hold little press conferences, conduct summits with other toys, or make surprise visits to disaster sites such as your messy office. Dare we say, the Obama Little Thinker is almost as cute as Obama himself!